Food likely isn’t top of mind when thinking of a retirement facility or other retirement communities in Pennsylvania. But it’s one of the ways we’re different. Just ask our residents. There’s food for the soul and there’s food for the body. As one of the best retirement communities in Pennsylvania, we bring you both with beautiful surroundings and quality cuisine that our residents rave about—unlike a typical retirement facility. Each day our dining rooms offer gourmet selections served in well-appointed settings. Treat your friends and family to a casual meal in our Bistro or wow them in the private dining room for a special occasion. We’re proud to offer residents a variety of freshly prepared meals served restaurant-style. Our recipes incorporate locally grown produce and fresh ingredients plus regional flavors and resident favorites. The menu selection allows our residents to choose items based upon their dietary needs and personal preferences. Residents can choose from several featured entrees at each meal and at dinner, an alternate choice of baked seafood, breast of chicken or a vegetarian selection is presented. Also available is a salad bar of fresh fruits, vegetables and salads. Fresh bread and rolls are baked each day by in-house bakers plus mouth-watering array of delicious desserts prepared daily. Residents and their friends and family enjoy occasional Sunday brunches often featuring waffle, omelet or carving stations. Fresh fruit, cookies, juices, coffee and tea are available for you and your guests throughout the day and evening. 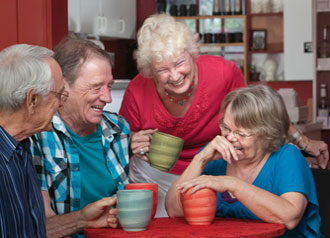 The Bistro is available for residents’ leisure. Our dining team prepares fresh salads, hearty soups, grilled specialties, build-your-own sandwiches, burgers and delicious sides, even breakfast entrees are served any time. It’s ideal for treating guests to lunch, catching up with neighbors or enjoying a quiet moment with a light meal and a good book. But the meal is just part of the experience. In addition to dining with their friends at their table, our residents enjoy socializing with their neighbors at happy hour. Plus, throughout the year our dining team hosts themed dining events designed by resident direction. Hungry yet? Stop by to taste why we’re not a typical retirement facility. Let us treat you and your guests to a personalized visit and a meal in our dining room or neighborhood-style Bistro on whatever day of the week works for you. And bring your appetite.